By the time the 1984 Detroit Tigers reached the postseason, rookie right-hander Carl Willis was getting to know his new club, the Cincinnati Reds. Although his time in Detroit was short, Willis stepped in for that championship club at crucial points of the season when the Tigers were thin on pitching. Seven years later, he became an integral part of another World Series team — and that time, he stuck around for the fun. Carl Blake Willis was born on December 28, 1960, in Danville, Virginia, to Ola and Mack Willis. He was raised 15 miles south in Yanceyville, North Carolina, where he began playing baseball at the age of 9. Willis graduated from the now-defunct Piedmont Academy in Providence, Virginia, and attended the University of North Carolina-Wilmington, where he was a standout pitcher for head coach Bill Brooks. In 1979 the team had finished with a record of 21-16. In 1980, Willis’s first year on campus, the club plummeted to 8-24. During his sophomore year, the team rebounded to a 32-15 mark. Meanwhile, Willis was emerging as a reliable, durable, and versatile pitcher. In 1982 he led the Seahawks with 15 appearances, eight wins, and a pair of saves. And by this time, major-league scouts were taking notice of him. After his junior year, he was selected by the San Francisco Giants in the 31st round of the 1982 amateur draft, but opted to return to school for his senior year. In his senior season, 1983, Willis led the team with seven wins, a 2.79 earned-run average, and three saves. He won 20 games during his career at UNC Wilmington, at a time when most colleges played fewer games than they do in the 21st century. Six weeks after Willis closed the book on his college career, he opened another volume, this one as a professional. On June 6, 1983, the Detroit Tigers selected him in the 23rd round (581st overall) of the amateur draft. Three days later Willis embarked on his professional career as Detroit assigned him to its Bristol (Virginia) Tigers affiliate in the Rookie-level Appalachian League — but he wasn’t there long. “He’s a quiet kid,” Lee noted. “He’s a real professional. He doesn’t say much. He just goes out and gets the job done. He’s very cool and calm on the mound.” In less than three months in professional baseball, Willis finished the abbreviated 1983 season with a record of 6-2 and a 2.76 ERA. That winter his career trajectory elevated rapidly when he caught the eye of Tigers pitching coach — and fellow North Carolinian — Roger Craig during the Instructional League in St. Petersburg, Florida. “He kept all his pitches low in the strike zone,” Craig wrote in his diary of the 1984 season, Inside Pitch: Roger Craig’s ’84 Tiger Journal. And that was enough to convince him that Willis deserved a nonroster invitation to spring training in 1984. That season the Tigers bullpen was all but set with veteran right-handed relievers Doug Bair and Aurelio Lopez as well as swingmen Juan Berenguer and Dave Rozema. Nevertheless, Willis impressed throughout the spring and was among manager Sparky Anderson’s final roster cuts — despite being tabbed by Anderson as the next Rollie Fingers. Similar comments by Sparky of other Detroit prospects often served as the kiss of death to their big-league careers. But such was not yet in evidence for Willis. As the Tigers prepared for the season opener in Minneapolis, Willis was assigned to the club’s Triple-A Evansville (Indiana) Triplets of the American Association. Willis excelled for manager Gordie Mackenzie and by early June he had posted a 4-0 record, a 2.67 ERA, and 10 saves. “The Tigers told me I was brought up here to pitch, not to sit,” he said. “Sparky told me I would be used primarily in long relief. But he also said I may be used in short relief if he felt Lopez and Hernandez were being overworked. He also told me I would probably become their late-inning right-hander in a couple of years.” Two days later, on June 9 — exactly one year after he began his professional career in Bristol — Willis made his major-league debut. With two out in the sixth inning and the Tigers losing 4-0, Willis relieved Lopez and coaxed Orioles catcher Rick Dempsey into a groundout to third to end the inning. Willis threw 2⅓ stellar innings, allowing just a double to Eddie Murray and an intentional walk to John Lowenstein. Willis appeared primarily in relief but made his first start on June 19 at Tiger Stadium, against the New York Yankees. He yielded nine hits (including a two-run homer by Don Mattingly) and four runs, all earned, while striking out three in the Tigers’ 7-6 victory — but did not factor in the decision. His first came on June 27 when he took the loss in one inning of relief against New York at Yankee Stadium. On July 2 Willis was sent down to Evansville to make room on the roster for shortstop Doug Baker, brought up to fill in for the injured Alan Trammell. On August 5, Willis was recalled to help the Tigers weather a storm of three straight doubleheaders. It didn’t turn out well. In the middle pair of twin bills, against the Red Sox in Boston, he started the nightcap and didn’t make it out of the first inning, surrendering five hits and four earned runs in just a third of an inning. His ERA was now 8.36. Willis atoned for that effort the following day, pitching two shutout innings in the first game of the final doubleheader. It was his final appearance with Detroit. “I don’t think I would have been given much of a chance with the Tigers because they have Lopez and Hernandez in the bullpen.” he added. In his two brief stretches with the Tigers, Willis was 0-2 and surrendered 25 hits and 13 earned runs in 16 innings. Willis was right; he did not start another game over the final eight years of his career. On September 1 Willis made his Reds debut, at home against Pittsburgh. He gave up just one hit and one walk in three innings of middle relief, pitching the third through fifth innings of a game the Reds won 7-5. coming from behind in the bottom of the 11th. Four days later he pitched again, in San Diego against the Padres. In one-third of an inning, he surrendered two runs, both earned, on two hits. He earned his first big-league save on September 22 against the Astros, pitching the bottom of the 13th inning in the Astrodome to hold a 2-1 Reds lead. Three days later, Willis made his final appearance of the 1984 season, taking the loss in the Reds’ 4-2 defeat against the Braves. His final line for his first season in the majors: 0-3 and a 5.96 ERA. Over the next two seasons, Willis shuttled between Cincinnati and its Denver Triple-A club, the Zephyrs. In 40 games for the Reds, he picked up a pair of wins and one save while being tagged for three losses in 66 innings. On December 10, it looked as if Willis’ Reds career was over. Left off the Reds’ 40-man roster, he was available in that winter’s Rule 5 draft and was selected by the California Angels. As he had been two years earlier, Willis was a final spring-training cut by the Angels and, as dictated by Rule 5, he was returned to the Reds. He again split time between Cincinnati and Denver in 1986 and finished with a 1-3 major-league record and a 4.47 ERA in Cincinnati, and 1-3 and 4.68 in Denver. Willis spent the entire 1987 season with the Reds’ new Triple-A affiliate, the Nashville Sounds of the American Association, going 6-4 with a 3.33 ERA. “I’m just on the wrong club,” he said. “There is no sense in me playing Triple-A for Cincinnati next year. I don’t want to hold anyone else back. It doesn’t seem like Cincinnati has any plans for me. 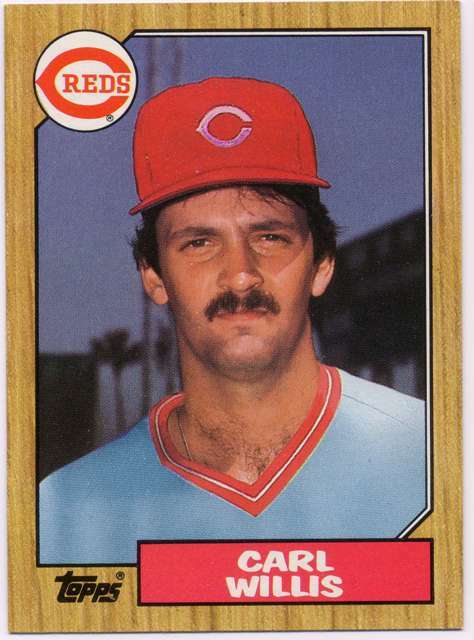 I hope they are going to try and trade me over the winter.” On January 19, 1988, the Reds granted his wish when they dealt him to the Chicago White Sox for minor leaguer Darrell Pruitt. Willis spent most of the 1988 season (4-4, 4.22) at the White Sox’ Vancouver affiliate in the Triple-A Pacific Coast League. He appeared in six games for the White Sox in ’88 with an 8.25 ERA and no decisions in 12 innings of work. In the offseason he was on the move again — and to a familiar club: the Angels, who selected him in the minor-league draft. In 1989 Willis was back in the PCL, this time for the Angels’ top farm club in Edmonton, finishing 5-7 with a 3.69 ERA. A free agent after that season, Willis signed with the Cleveland Indians, who assigned him to their Pacific Coast League club in Colorado Springs, where any enjoyment over his 5-3 record was tempered by an ERA of 6.39. After the 1990 campaign Willis’s career finally gained traction when he signed in December with the Minnesota Twins. He quickly became an indispensable piece of the team’s bullpen in the early 1990s. Though he started the season at Triple-A Portland, it was a brief stay (1-1, 1.64 in 11 innings spread over three games). In 40 big-league games that year, Willis posted an 8-3 record with a 2.73 ERA — his best statistical season — for a Twins club that won 95 games in a stunning worst-to-first reversal from the year before. In the 1991 American League Championship Series against the Toronto Blue Jays, Willis appeared in three games, allowing just two hits in 5⅓ scoreless innings. After eliminating the Blue Jays in five games, the Twins moved on to face another worst-to-first team, the Atlanta Braves, in the World Series. In Game Three at Atlanta’s Fulton County Stadium, Willis tossed scoreless eighth and ninth innings in relief of Steve Bedrosian; the Braves won, 5-4, in 12. The next night Willis relieved a fellow former Tiger, Jack Morris, in the seventh inning with Twins clinging to a 2-1 lead. After two quick outs, Braves left fielder Lonnie Smith took Willis deep to tie the game at 2-2. It was the only hit off Willis in his inning and a third of work. The Braves won the game 3-2. He appeared in Game Five and allowed three earned runs on four hits, including a home run by Brian Hunter, as the Braves rolled over the Twins, 14-5. Two days later, in Game Six, Willis redeemed himself in his fourth World Series appearance throwing 2⅔ innings of scoreless relief in the Twins’ stirring 4-3, 11-inning victory that forced a seventh game. None of the Twins relievers saw duty in that decisive game; Morris pitched a legendary 10-inning shutout as the Twins sealed their second World Series title in five seasons. In essence, Willis duplicated his fine 1991 season in 1992. His 7-3 slate and 2.72 ERA virtually matched his basic numbers from the year before. He finished 21 games (as opposed to nine in 1991) despite pitching almost ten fewer innings over 19 more games. In retrospect, the 1993 season, although showing just a slight slippage in Willis’ numbers (3-0, 3.10 ERA), foreshadowed some difficulty in that he still finished 21 games but appeared in six fewer games and pitched 21⅓ fewer innings. He did a two-game stint in Portland, making two appearances and surrendering two runs (one earned) in four innings — not bad until one notes that he gave up six hits and a walk. The situation came crashing down in 1994, as Willis struggled through 59⅓ innings (1⅓ more than in 1993), giving up 89 hits to finish 2-4 with an unsightly 5.92 ERA. That the end had arrived became painfully clear in 1995. Willis appeared in three games but only two-thirds of an inning, in which he faced 12 batters while surrendering five hits, five walks, and seven earned runs. Not surprisingly, the Twins released Willis on May 4, 1995. Six weeks later, on June 27, he again signed with the Angels and was assigned to the club’s Triple-A Vancouver Canadians in the PCL. Willis appeared in 20 games for Vancouver, posting a 2-2 record with one save and a 4.11 ERA. At the end of the 1995 season, at the age of 34, Willis’s career came to an end. His final line: 267 games, a 22-16 record, 13 saves, and a 4.25 ERA with four major-league teams. Upon his retirement, Willis spent 13 seasons in the Cleveland Indians organization as a pitching coach, first in the minors and then seven seasons as the club’s major-league pitching coach on the staff of manager Eric Wedge. In 1998 Willis was inducted as a charter member the UNC-Wilmington Athletic Hall of Fame. In 2010 Willis joined the Seattle Mariners as a minor-league pitching coordinator, but on August 9 was promoted to be pitching coach for the parent club. In the offseason he resided in Durham, North Carolina, with his wife Rachel, daughter Ally, and sons Daniel and Bryson. Craig, Roger, with Vern Plagenhoef. Inside Pitch: Roger Craig’s ’84 Tiger Journal. Grand Rapids, Mich.: Eerdmans, 1984. 86. Detroit Tigers. 1984 Detroit Tigers Media Guide. Detroit: Detroit Tigers. 1984. Atkins, Lissa D. “Divided loyalty is part of the game back home: Atlanta is their team; Twins’ pitcher is their hero.” Greensboro News-Record, October 24, 1991. C1. Carree, Chuck. “Tigers deal ex-Seahawk ace Willis.” Wilmington Morning Star, September 1, 1984. 1D. Carree, Chuck. “Willis’ future isn’t with Reds.” Wilmington Morning Star, August 31, 1987. 1B. Carree, Chuck. “Willis makes majors in exactly one year.” Wilmington Morning Star, June 13, 1984. 1D.